Burn CD+G discs on your computer. Rip CD+G tracks to hard disc. Power CD+G Burner 2 is an all-in-one solution to CD+G karaoke disc burning and ripping. 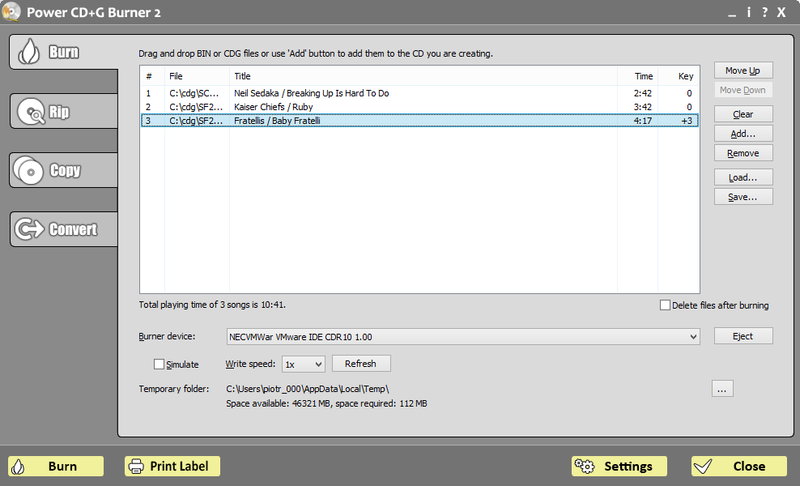 It will burn CD+G (BIN, CDG, MP3+G, and ZIP. 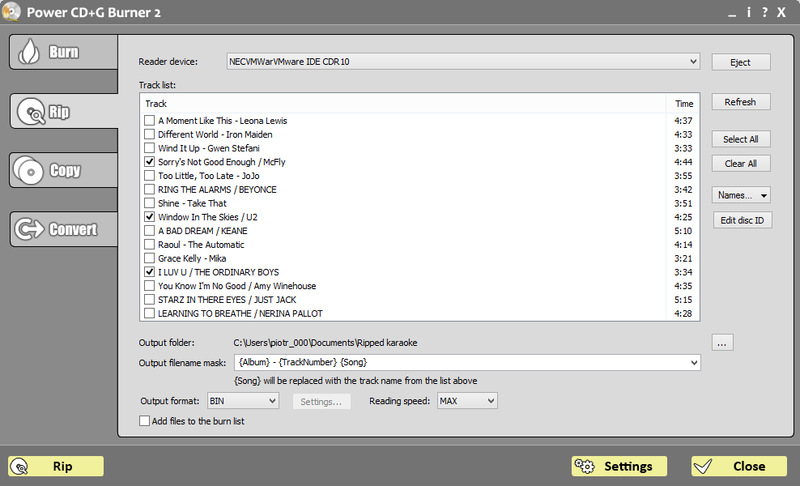 KMA, and MCG) songs on most of modern CD-R drives. With Power CD+G Burner 2 you can save Karaoke CD+G tracks to hard disc (in MP3+G and ZIP formats) and copy CD+G with a single mouse click. Power CD+G Burner costs$39 USD. Burning CD+Gs has never been so easy -- now it is a matter of selecting the files you would like to burn and clicking a button. No messing with many tools at once - just click and go! Stop wasting time on encoding, interleaving, converting, and burning. Don't waste money on third party software. Power CD+G Burner 2 is all you need to write, read, and copy CD+Gs. Power CD+G Burner 2 works under Windows 10/8/7/Vista/XP/2000. It should work under Windows 98/ME, but you need ASPI drivers (you may download them from here ). Works with most of modern CD-R drives (drive has to be MMC-compatible and has to support DAO/96 mode). Please note that the CD+G Burner Software is not compatible with a Mac O/S operating system. If you have downloaded the trial version and purchase the CD+G Burner 2 Software, an unlock code will be required to unlock the trial version to a full version. The unlock is available once you purchase the software or go to our homepage, LOGIN, and then click on "Purchased Software" under My Account. Your unlock code is here. Activate the software, click on the UNLOCK tab, enter in the correct info. Enter in the email address used on your purchase. The unlock tab will disappear if you entered in the correct info.